“The budget is the bane of corporate America. It never should have existed,” said Jack Welch, former CEO of GE. So what’s the alternative in today’s complex digital era? Budgets as they are done today are costly, time-consuming, and ultimately ineffective. In this article, I will explain why a smart rolling forecast (SRF) is your best option for navigating this highly volatile digital era to ensure your company’s success. To remain competitive on a global scale, the new smart and agile digital enterprise needs data in real time, relying on information from optimized and automated processes that eliminate the risk of human error and tedious, inefficient tasks, allowing you to quickly anticipate and adapt to changing market conditions. Adopting BI and AI technologies will turn your business data into a commercial advantage by making instantaneous optimized business decisions. With the help of a wide range of intelligent robo–tasks*, every business action can be completed with minimum time and effort. Infusing AI into robotic process automation (RPA) to provide a smart rolling forecast. Thus to obtain an efficient SRF, your enterprise needs to rely on several robo-treasury tasks. They will greatly reduce the number of manual operations that undermine the effectiveness of your teams and impact your revenues over time. Finally, I will explain why one of the main purposes of a SRF is to help your company better anticipate changing market conditions with quicker and more flexible cash flow planning and forecasting. It’s time to let go of the burden of costly annual budgeting cycles and start working on the Beyond Budgeting Model, which promotes business agility and adaptiveness to meet the challenges of the highly volatile digital era. What is the digital era ? The digital era is an economic system in which the high pace of knowledge acquisition makes markets fast-moving, unpredictable, and full of opportunities. Without timely, low-cost expert advice, these conditions can make your business difficult to manage. Welcome to the new era of extended network connectivity, artificial intelligence, data analytics, and cybersecurity producing automated, autonomous, and unmanned systems. What is a cash flow forecast ? A cash flow forecast estimates the amounts of cash flowing in and out of your bank accounts over a specific period of time. Cash inflow categories can include incoming service and product revenues, while cash outflow categories can include outgoing salary and supply expenses. A money-borrowing category can, for instance, be used to forecast how much money your company will need to borrow and when it will need to repay it. 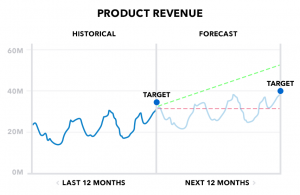 As shown in this chart, using historical data of product revenue, AI can generate a forecast that takes into account cyclic and seasonal patterns while adding percentage points to meet increased sale targets. What is the difference between a budget and a forecast? A budget is an estimate of revenues and expenditures for a specific period of time. It is a calculation of what a business hopes to achieve in the next 12 months, whereas a forecast is an estimate of what will occur. The key difference between a budget and a forecast is that a budget is a static plan of where you want your company to go, knowing what you currently know about your business situation. A forecast is the daily dynamic indication of where your business is actually going. Why are budgets ineffective ? An annual budget process is not agile, and because it is designed by multiple people at the company, can lead to struggles over how budget targets are established, how targets will be met, and who takes responsibility. The rapid pace of change in the business environment often makes the assumptions of the annual budget outdated almost the minute they’re published. Companies need to vastly improve their ability to anticipate upcoming business situations and be more agile with their business decisions. The agile digital company relies on a forecast process that involves ongoing planning and analysis, giving it a giant leg up on annual budgeting. What is a rolling forecast ? A rolling forecast allows for continuous planning using a fixed number of periods. An efficient rolling forecast should include at least 36 months. At the end of each month, another month is added automatically. This way, you are always forecasting at least three years into the future to better measure the impact of your company, what-if scenarios about your business revenue, and expense targets. 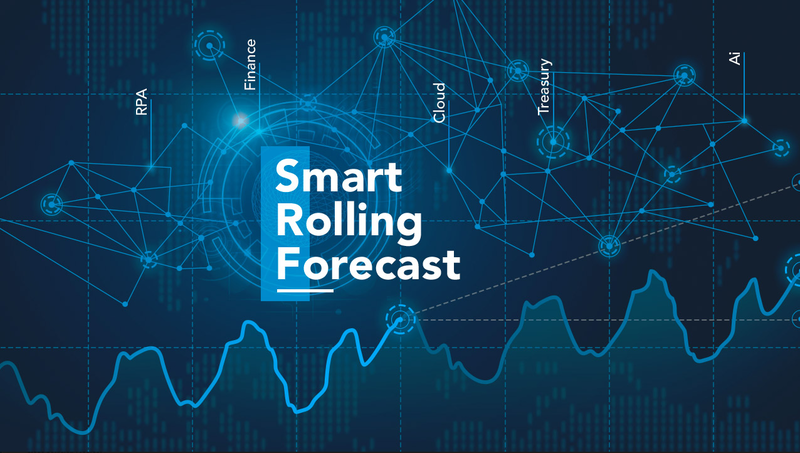 What is a smart rolling forecast (SRF) ? A SRF is a standard rolling forecast that’s automated using multiple intelligent robo-treasury tasks (re: automated treasury tasks), eliminating the need to do the same error-prone and tedious manual operations each day. A SRF is an opportunity to design an efficient and optimized forecasting process to rapidly, continuously, and intelligently predict the future of your business in a way that provides your executives with a variety of likely outcomes based on a range of options. A SRF is about designing a process that enables confident decision-making when starting a new business development project, while helping you respond swiftly to random events. The name of the game is now being able to quickly evaluate alternative courses of action to deal with unpredictable events, which will become increasingly frequent with the exponential complexity of the digital era enabling new market forces of supply and demand. It’s important to look ahead and use all available information combined with AI techniques applied to the company’s historical data to make decisions that maximize your company’s potential. An efficient SRF cannot be implemented using spreadsheets. Excel spreadsheets may be easy to use, but they are not appropriate for advanced forecasting using treasury best practices and advanced AI. With spreadsheets, there is also a high likelihood that the many employees at your company who perform unsupervised and non-audited manual data entry will make costly errors. What are the benefits of a SRF ? First, it greatly reduces the need to conduct the challenging annual budgeting process as it is transformed into a much more efficient and manageable process each day of the year. Second, a SRF process becomes a flexible part of your business, instead of the onerous task of creating a budget that is unlikely to be accurate anyhow. You can get a better overview of your company’s situation and better manage business risks over time with an efficient SRF. When expanding your company, you’re likely often faced with making a difficult decision at the right time with the right measure to avoid getting in trouble or missing an opportunity to grow your business. A SRF will help you make the best business decision at the right time, while managing business risks without being overly impulsive for the wrong reasons. When is it the optimal time to hire new employees? How many should be hired and when to support a major new project? The same goes for the level of supplies, investments, borrowing, and so forth. For a small company, you might be able to squeak by with managing your company using information from just your bank accounts or relying your entrepreneurial instinct, but if you want to leverage the exponential growth possibilities of the new digital era, you need smart tools. Moreover, Canadian SMEs need to make informed decisions in real time that will allow them to scale up and compete worldwide. A SRF can help reduce risks and provide a much better understanding of the company’s situation based on standardized reporting on its evolution in real time. With a SRF, you can avoid the hassle of creating an annual budget or missing opportunities due to long planning cycles, while maximizing productivity by spending less time gathering data and more time analyzing it. You can still set your revenue targets and measure your daily operations against it. Finally, you can also increase or decrease your revenue targets each year based on your forecast. It’s important to understand that a smart rolling forecast automatically includes the management of revenue targets for monthly, quarterly and yearly periods of time. Every day, the forecast is monitored and measured against revenue targets. A rolling forecast will steer the company toward its targets by making expert decisions to stay on course and meet objectives. AI can generate, from your historical data, the rolling forecast automatically and on demand by maintaining a fixed period of three to five years thus increasing the quality of all predictive category values with each passing month. A rolling forecast will automatically add one month at the end at each month-end to keep the fixed period set at three to five years. The AI reconciliation process can also consider the differences between a predicted value and reconcile bank movement value to improve the quality of the regeneration of the rolling forecast to improve its performance over time. A SRF helps you automatically adjust your forecasts to align costs with unexpected changing revenues to make better business decisions. Great forecasts are not only determined by initial projections, but also by their ability to adapt to market fluctuations and the resulting decisions. With good reporting and a dashboard to monitor the forecast values against your revenue targets, a SRF can help you can navigate this complex digital era like never before. Ultimately, a simplified yet more accurate budget can be instantly generated in an Excel file so that bankers are better able to track their investments each month with results they can truly trust. To obtain an optimized SRF, the integration of intelligent analytical solutions should be done iteratively, adding each component and refining it with each customer implementation. The development is done in collaboration with each customer so that the solutions are adapted to their needs. The development philosophy incorporates both a common AI component to all companies (AI generic framework) and a personalized component that improves customer performance from its own data. A continuous improvement approach will provide customers with effective and relevant solutions. Let’s start by defining a bank statement—it’s a summary of financial transactions which have occurred over a certain period in your bank account of your financial institution. Bank statements can be downloaded as electronic versions from your bank’s website or automatically from BAI2 files or SWIFT transaction messages. To generate an accurate forecast and improve it each month of each year with additional data, you will need to validate its accuracy over time. The best way to improve your forecasts is to have an efficient reconciliation process to see how close your real bank statement transaction amounts are compared to your predicted amount values for each inflow and outflow category of your forecast. The first step toward bank item reconciliation is to provide an efficient and automatic categorization of each transaction. With a robo-categorization process, statement item categorization is learned from months of previous transaction data, greatly reducing the need for doing any manual categorizations. The second step is to use a robo-matching process to reconcile high-volume of transactions with an efficient auto-matching process to get rid of one of the most time-consuming forecasting operations. The percentage of matching errors is reduced with each month that goes by as more data is gathered. This is required to further improve the AI algorithm model of the robo-generation process predicting your company’s future transaction amounts. With years of data, the AI model of the robo-generation process will be optimized to generate high-quality rolling forecasts. A smart rolling forecast (SRF) is one of the highest-value business processes of the new smart and agile digital enterprise. The new smart digital enterprise recognizes that going from a traditional enterprise to a lean enterprise requires going through a phase of process simplifications and improvements for creating products and services to meet customer orders rather than marketing targets. The goal is to achieve important cost and time reductions in the development of new products and services to greatly improve time to market. The agile enterprise embraces change in a highly competitive environment of unpredictable customer opportunities. Agility has arisen as an upgrade to generic mass production. The transition to business agility is justified to provide adaptive products configured to the requirements of individual customers. 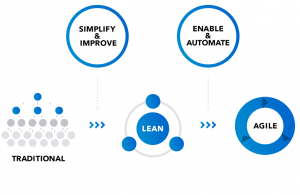 Going from the lean enterprise to the agile enterprise requires the automation of each lean business process. One of the most important is to improve the way businesses forecast their finance situations by having a fresh business perspective each morning of each month of each year. To do so, I propose implementing an efficient SRF to better navigate this complex digital era. I have also presented the SRF as an alternative to being locked into highly demanding budget definition and approval cycles. Budgets are currently used to set revenue targets and to monitor and manage the performance of the company accordingly. Most managers are held accountable for meeting their quota, combined with financial incentives to motivate them to hit their own targets, often at the expense of common sense and the company’s best interests. Stay tuned! In my next articles, I’ll discuss how an efficient SRF can support the vision of the Beyond Budgeting model, which focuses on mobilizing people to achieve profitability in a new smart and agile digital enterprise. I’ll will also present how we have implemented our SRF using advanced AI algorithms implemented with Microsoft Azure Learning Services.